TUCSON, AZ (Tucson News Now) - Failed pumps added more problems to the already flooded Stone Avenue underpass on Tuesday. Two pumps built into the underpass kick in automatically when it starts to flood. Both pumps failed Tuesday night, according to the City of Tucson Department of Transportation. A vehicle had to be called in to pump the remaining water out of the underpass. 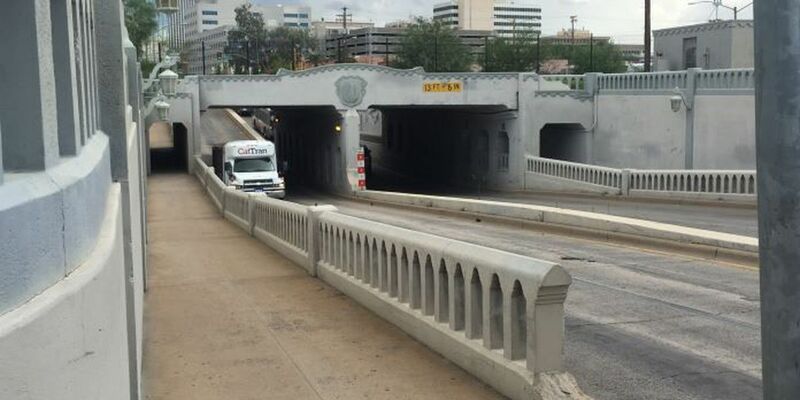 A project called "Downtown Links" is already in the works to fix this persistent issue, according to Sam Credio, engineering manager for the City of Tucson Department of Transportation. This $76.1 million RTA funded project will happen in three phases. The first phase started in 2010, which involved improving the drainage near 8th street. The second phase was the widening of St. Mary's Road and improving the drainage. The third, and largest phase will improve roads, build bridges and improve the drainage in the area from Church Avenue to Broadway Boulevard. Credio said the new drainage system will involve installing catch basins near the Stone Avenue underpass, helping catch the water during heavy rainfall, and ultimately getting the water into the Santa Cruz River. "That's going to prevent a lot of that water from getting into the underpass," Credio said. If water does get into the underpass, the new system will prevent it from flooding. "We're actually going to get rid of the pumps and we're going to connect it with a large diameter underground storm pipe and then connect it to the rest of our system downstream," Credio said. Construction will start next year and is expected to last two to two and a half years.